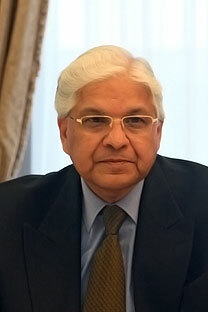 Mr. Ashwani Kumar, Honorable Minister of State for Parliamentary Affairs, Science & Technology and Earth Sciences of the Republic of India is currently on his visit to Russia from 4-9 May 2011. He is accompanied by a Parliamentary delegation comprising of 7 members representing different political parties of the Indian Parliament. In addition to Moscow, the parliamentary delegation plans to visit St Petersburg and tour the winter Olympic facilities in Sochi. “The purpose of my visit is to reinforce reiterate and reaffirm the special and strategic partnership between our two countries. This was particularly necessary because of transformational changes that have taken place in the world. The paradigm shifted in the architecture of global power, it requires a review of strategies and the nature of global challenges, necessitates concerted collective action on the global stage,” – Dr. Kumar said. During his visit to Moscow Dr. Kumar met Mr. Konstantin Kosachev, Chaiman of the Foreign Affairs Committee of the State Duma and the other members of the committee. Both sides agreed that for India and Russia, as two multi religious societies, terrorism and religious extremism posed a grave threat. In the contexts of recent developments in Pakistan and Middle East, both sides agreed, that terrorism in any form and anywhere has to be jointly fought and eliminated, and re-affirmed the need for two countries to strengthen their counter terrorism cooperation. Taking note of development in the Middle East and North Africa, both sides re-affirmed the importance of respecting the sovereignty of countries and upholding international law. During the meeting the Russian leadership reiterated their support for India’s permanent membership of UNSC and proposed active cooperation in regional and international fora including G20, SCO, BRICS and UN. Mr. Ashwani Kumar also met several distinguished academics specializing in Indian studies and interacted with Russian heads of the ongoing bilateral S&T cooperation programs. He expressed satisfaction at the recent renewal of the ILTP program for a further 10 years period. There are 82 joint projects between Russia and India already on the way in the field of genomics and diseases, biotechnology and antibiotics, new biological entities for cancer, joint manufacturing of chips for solar energy. This is to addition to ongoing research in space programs and in the defense sector,” – he said. The cooperation for the new research areas of biotechnology, nanotechnology, medical science and meteorology is being discussed. In his speech to journalists Dr. Kumar has emphasized that India and Russia have had unique relationships. “These relationships are encored and routed in an emotional connect between people of Russia and India. Russia has been a friend of India at critical moments in its history and we are deeply grateful for Russian support”.